I love ink. As a 25-year veteran newspaper reporter, I’ve seen a lot of it pressed into use. I have to admit to a bit of fondness for seeing it materialized as my name in a byline. Don’t begrudge me a little joy in that. There was plenty of journalistic misery to go along with it. I finally got up close and personal with printing ink in an intro class on printing the Cherokee language with a Letterpress. I knew walking into the classroom that it was going to be a sensual experience. I also knew that I didn’t want to just recreate what others had done artistically with these arcane presses. But first, I needed to do the courting dance. And I wanted to touch the ink. Our instructor, Frank, gave us an initial introduction and handed out the obligatory instruction sheets, held up a composing stick and picked up the first letters of his name in the form of cast type pieces to show us what we would be doing in our first assignment. I felt like a kindergartener leaning forward, watching his hands maneuver the type as he arranged it on the composing stick, and waited for my turn to touch the ends of the pieces that formed the letters of his name. I wasn’t disappointed. 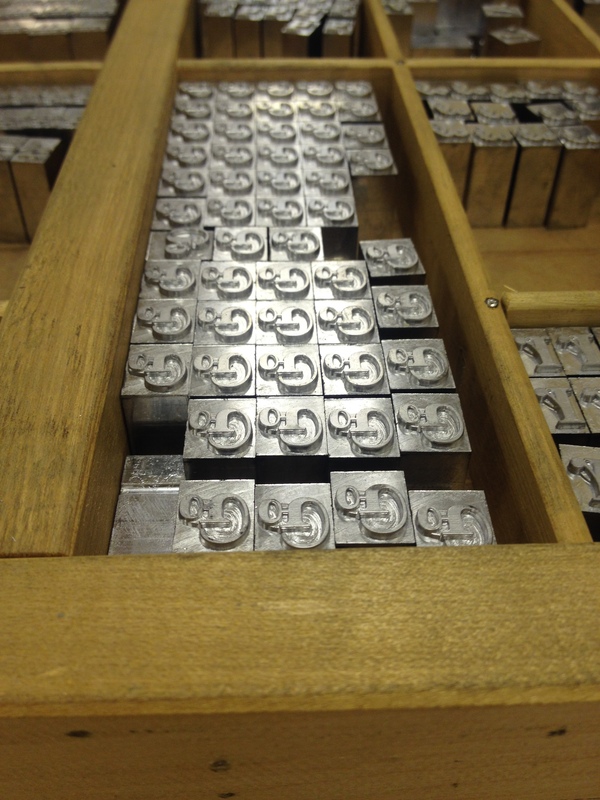 Frank let us explore all of the printing tools, font sets and presses in the shop. He patiently answered every question we pelted him with. My classmates were a mix of Anglo and Cherokee and I strained to hear the unique lilt of western North Carolina Cherokee murmuring through the room. I didn’t feel intrusive since I didn’t understand anything they were saying. I was mainly interested in the way they were pronouncing the basic Cherokee sounds. For all I knew they could have been (and probably were) joking about the annoying U-ne-ga.
Rodney, a particularly large and imposing Cherokee, was kind to me. Rodney helped me correct errors and find the right pieces. As a newbie, it was tough enough recognizing the 84 individual characters of the Cherokee Syllabary in the upright position, let alone in reverse, which is obviously how characters need to be cast to create a printed text. Finding and arranging my name in Letterpress type is no small task. I used a composing stick to hold the type pieces in order. I also misspelled my name the first time. The inked press roller was beautiful, the color of the night sky. After forming my name on the composing stick, I held it close and smelled it, residue of ink and oil and worn smooth by countless hands of craftsmen. I looked at my own hands holding the polished gleam of the composing stick. I wondered how many hands had held the stick before me. How many times the hand cranked printing presses had rolled down the tracks and back. I wondered about all of the ideas and epiphanies that had trickled down onto paper, pressed into the fibers by whirling metal indigo gleaming drums. The Cherokee Syllabary has 84 characters, dwarfing the English language’s 26 letter alphabet. Just then Frank walked to a nearby workbench, picked up what looked to me like a spackle knife and slid it into the most luscious pool of indigo ink the consistency of warm honey. He turned and touched the knife gently to the press rollers, stepping back as he flipped the “on” switch. Slowly the ink spread along the rollers and drum, thinning out on the surfaces to the shade of a full moon night sky.